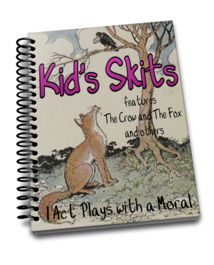 Kid’s Skits - A unique collection of children’s playscripts – all comprising 1 Act Plays with a Moral. The 12 fairy tale scripts in this collection are all adaptations of very well-known and timeless fables from such as Grimm’s, Hans Anderson, Aesop’s Fables and other cultural legends and stories. All have a moral. A lesson to be learned, if you will, allowing for that teachable moment we all love. These well-known fables are now transformed into action plays. Would not experiencing the lesson learned be more advantageous than merely reading of it? Cat and Dog A cast of 2. The lesson is the value of teamwork. Experience first-hand how Dog and Cat learn of one another’s faults and behaviors and in the end find a way to live together in harmony. Cat and Mouse A cast of 3. We might take away a few different lessons by play’s end. Doing as you are told. On the value of good advice. The Clever Kid A cast of 3. This lesson is on critical thinking and problem solving. Tis truly a clever one indeed who can outsmart those who try to harm. A valuable lesson. The Crow and the Fox A small cast of 3 highlights what happens when you are fooled and fall for trickery. How quickly you can lose if you are not quick to think. This lesson becomes a hands-on lesson by this play’s end. Perhaps this play is where the Fox gained his wily reputation. Sly Fox he is. Each in His own Place A sizeable cast of 6. We learn the value of being satisfied with what we have. Also “Be careful what you wish for” comes to mind. Foolish Jack 2 players in this cast teaches, quite nicely, the value of thinking for oneself and thinking vs reacting. Foolishness comes oft times by way of not thinking. Henny Penny A cast of 7. A nice size play which highlights what happens when one jumps to conclusions and how important it is to think before you act. Also provides the opportunity of discussions on careful behavior and who is trustworthy and who is not. There are many versions throughout history of this very old folk tale. Some will remember Chicken Little, which is an adaptation of this Henny Penny story. The origins of many nursery rhymes and tales are obscure in history. Henny Penny and her friends are believed to be derived from an old Scottish Tale from the early 1800’s, but quite possibly even earlier. “Chicken Little” has become well known for mass hysteria. Isn’t it funny how such a very old nursery tale still has an impact on our thinking so many, many years in the future. The actors will have fun becoming their favorite barnyard animal and working their way through the valuable lessons to be gained in this fun action play. The King and the Bees A cast of 6. Critical thinking and problem solving skills highlighted. A play based on an actual historical figure, King Soloman. A wise king. Watch how he solves this problem right before your eyes. Every boy in the group will want to be King Soloman. Who doesn’t want to be the wise one? The Miller and his Son A large cast of 14. The lesson: You will not please everyone all of the time. A valuable lesson, to be sure. The Old Man and Grandson Here we have a short skit with a cast of 4, teaching the value of the phrase “Do unto others and you would have them do unto you.” We also learn how to treat someone fairly. There’s even a lesson in this play for us parents. They are truly watching us. The Rubicon Race With a grand cast of 8, this skit teaches a bit about critical thinking and problem solving. There is even an opportunity for more participants in the action scene, albeit non-speaking parts. The Rubicon Race is just a silly, fun way of dealing with a problem. The outcome is just as silly, but that makes for a fun play in the end. The added benefit of a good bit of exercise as well. They will enjoy this one. The Travellers A cast of 3. A short skit on honesty. We have all learned the value of sharing. Here we learn not only a lesson on thievery and honesty, but sharing as well. Loosely suggested age range might be grades 3 and above. Quite a few of these skits might also lend well as puppet shows. Kids Skits E Book is totally risk free to try. Nothing to lose. If it isn’t everything I said it is, then return it for a full refund. You get instant access to your copy of Kids Skits in under 10 minutes through a safe and secure transaction. Right after your order is approved (usually in seconds), you will be able to download immediately. It's that easy. And, with PayPal you know it’s secure. Kids Skits is not available in stores.